I apologize in advance for the terrible puns that are about to roll through this website, but I spent about a week in a town called Man, Cote d’Ivoire; and with a name like that you have to realize some puns are going to flow. My arrival in Man was such a blessing (see I can’t even say that without feeling like typing “insert joke here”). I needed something to push me a bit again. It might sound crazy, but when you travel all the time places all start to blend together and it’s hard to feel inspired. I’ll never forget the first time I felt like this. I was in Argentina and had just broken up with a girl. I felt like I was done with travelling and that I was about ready to pack my bags and head home. However, after visiting Perito Moreno Glacier I was completely charged and inspired again. I felt a bit the same way when I arrived in the Fouta Djallon of Guinea. Just like everywhere before arriving in Cote d’Ivoire completely re-energized me. This is a photo from a waterfall just outside of Man and I stopped here after completing a 40km hike of one of the highest mountains in West Africa. To say the least, diving in this water was absolutely perfect. I think nearly every one of these “photo of the week” explanations I talk about the technical aspects of a photo. But I also try to mention what I think is the most important part of getting a great photo and that’s going the extra couple steps of effort for the “better image”. There was a platform here to shoot from that would have been alright, but I decided to go knee-deep into the water so that I could get the better shot. From this angle, I managed to compose an image that had many more layers it. 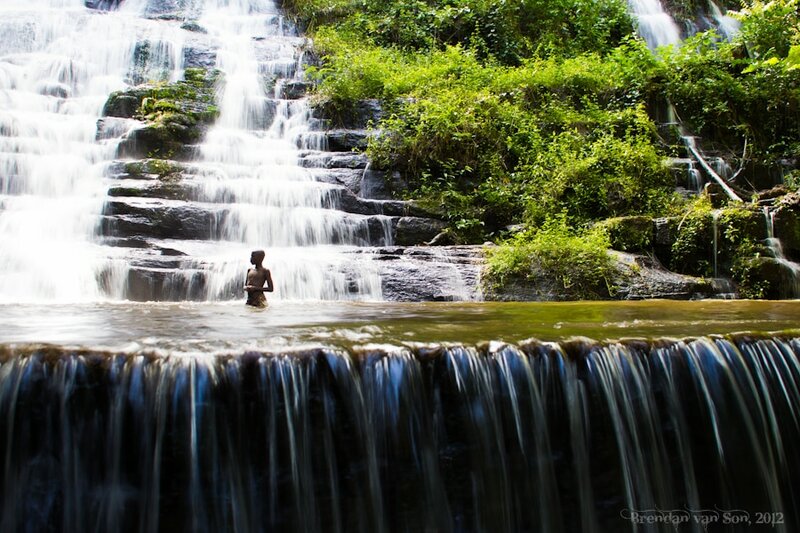 Rather than just the waterfall, here we have two levels of waterfalls – foreground and background – and we also have a local having a swim to add a little something extra. Overall the general difference between a good photo and a bad photo is usually just spending a couple minutes more exploring your options to get the best composition. And this holds true whether you’re photographing food, landscapes, buildings, or even waterfalls like this one. Brilliant photo! Waiting for the person to move into just the right spot and position = near perfection. I agree totally that the difference between a mediocre pic and an excellent one is PATIENCE. I’ll wait quite a while for sun and clouds to shift; it’s always worth the wait. Beautiful shot. I so envy what you do, I don’t get much chance to get out with my camera these days.